The Minnesota Vikings announced their personal seat license prices on Friday; if you’re a VIkings fan you probably already know all about what seats cost how much, and if you’re not a Vikings fan you hopefully won’t care. So the broad summary: Unless fans want to sit in the 12,000 seats in the last rows of the nosebleeds, they’re going to need to plunk down between $500 and $9,500 per seat just for the right to buy tickets, which will then run between $50 and $400 a pop. That’s pretty much what the team hinted at back in October, and about middle-of-the-pack for NFL teams that require PSLs. There’s been much uproar (including from Minnesota’s governor) that this is an outrage given that the public put up a large chunk of the money for the Vikings’ new stadium (at the behest of Minnesota’s governor), and you can understand that fans aren’t happy to hear that seats at their shiny new football home will come with a mortgage in addition to yearly payments. But really, PSLs are just an early form of crowd-funding: By asking fans to put up cash for something that was previously free (the right to be on the season-ticket list), teams are effectively monetizing an asset they hadn’t used before, while fans get something they can sell when they’re done with it instead of just dropping their ticket rights for nothing. (The Vikings PSLs are perpetual so long as you keep buying season tickets, and can be sold after the first year.) 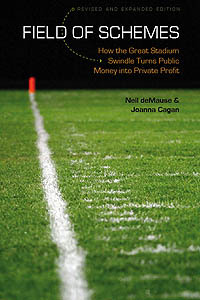 And if they really think it’s too rich for their blood, they can refuse to buy the PSLs at this price and force the Vikings to drop their rates as other teams have done — yes, it’s part of the growing aristicratization of sports, but we’ve crossed that bridge already, and without PSLs the Vikings would likely just charge even more for tickets themselves. If you want a cause for outrage, focus on the fact that the state is actually selling the PSLs on the Vikings’ behalf, as a tax dodge. Or on the fact that the state agreed to pay for half the stadium construction cost (really more than 100% of the cost when operating subsidies and tax breaks are figured in, but who’s counting?) because Vikings owner Zygi Wilf only could afford to pay for the other half, when Wilf’s half will likely be mostly covered by PSL fees and naming rights. Who pushed for that deal again? Oh right, that guy. This entry was posted in Minnesota Vikings by Neil deMause. Bookmark the permalink.